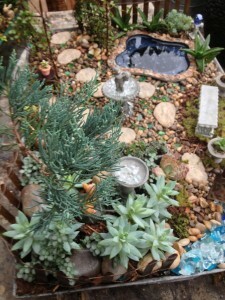 Small, Smaller, Smallest – Miniature Gardens! Kids love them and so do adults! 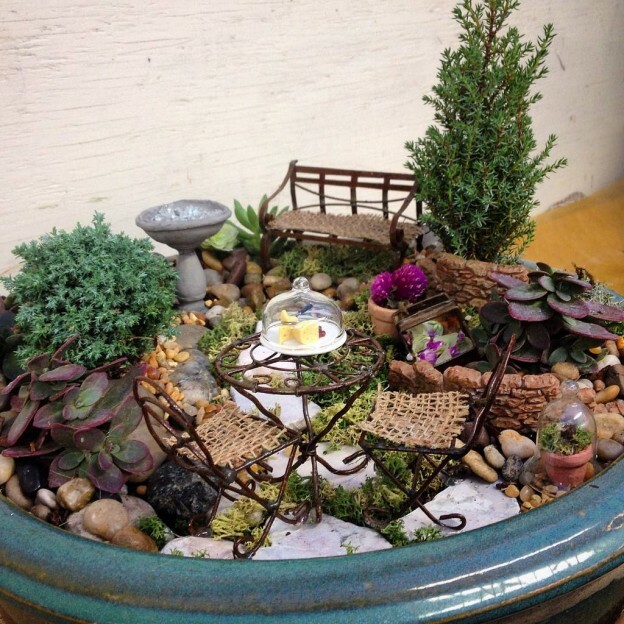 Miniature gardens capture the kid in all of us, and maybe that’s why they’re so popular. Really, how can you resist the magic of these tiny worlds? From the smallest birdbaths and ponds (every garden should have some water, after all) to the perfect path leading to a miniature bench (yes, that’s a kitty sunning itself there..) we think they’re magical. 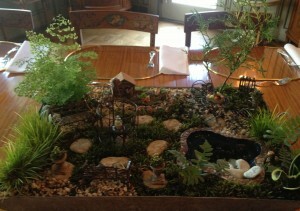 We created one special garden for a little 7 year old – it was a Christmas gift from her grandmother. 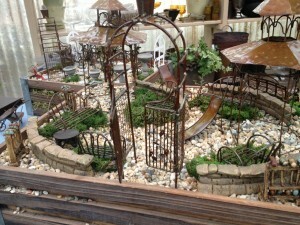 Imagine that little girl’s face when she caught sight of her very own little garden! From that child’s delight to a landscape used as a centerpiece on a luncheon table, all of the gardens we create are meant to last – just let us know where you’d like to use them, inside or outside, and what type of light they’ll be in and we’ll take it from there – we promise you’ll be delighted! Another tiny garden we created is a bird’s eye view of plants designed to live in a sunny location – we used plenty of succulents and other small plants that can take some heat! Maintenance involves keeping plants trimmed and watered as necessary…no aching back tending these gardens! How great is that? 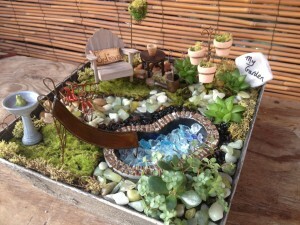 We’ll be posting more photos of our miniature gardens and accessories so check in often! This entry was posted in Container, Gifts, Miniature Garden and tagged arrangements, containers, hobby, miniature garden accessories, miniature gardens on February 16, 2013 by Kris Blevons.